Like the other films in the series, this is beautifully animated and stays watchable thanks to its likeable cast of characters, but it's never as funny as it should be and the 3D effects are under-used. Directed by Carlos Saldanha, Ice Age 3: Dawn of the Dinosaurs opens with Manny the mammoth (Ray Romano) and Ellie (Queen Latifah) expecting a mini-mammoth, and Diego the sabre-toothed tiger (Denis Leary) wondering if he's losing his touch after failing to chase down a sassy gazelle (Bill Hader). Meanwhile, Sid the sloth (John Leguizamo) gets himself into a whole heap of trouble when he finds three dinosaur eggs and they hatch into a trio of adorable baby T-Rexes. When the T-Rexes' mother appears, she snatches up her babies and Sid and disappears into a mysterious underground world (neatly side-stepping the whole there were no dinosaurs in the ice age thing) and when Sid's friends give chase, they meet a swashbuckling weasel called Buck (Simon Pegg), who agrees to help them rescue him. Meanwhile, hapless rat-slash-squirrel Scrat (Chris Wedge) is still chasing that elusive acorn, but also finds both a rival and a love interest when he meets foxy female rat-slash-squirrel Scratte (Karen Disher). 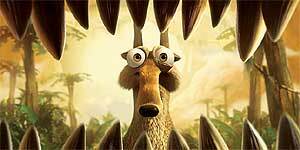 As with both previous movies, Scrat is once again the best thing in the film. The highlight this time round is a wonderful tango sequence with Scratte, set to Lou Rawls' You'll Never Find Another Love Like Mine. The voicework is excellent, though Denis Leary takes more of a back seat for the threequel, allowing Pegg to shine in a likeable guest appearance. Similarly, the animation is appealing and the 3D environments work well, though the general things-coming-out-of-the-screen effects are underused, which is a shame, because there's no shortage of opportunities. However, the biggest problem is that, at least for adults, the film isn't nearly as funny as it should be, while some of the over-the-heads-of-children gags should probably have been dropped and the anachronistic jokes (such as a rock phone scene) are very irritating. As threequels go, Ice Age 3: Dawn of the Dinosaurs won't disappoint fans of the previous two films and kids will love it, but adults may find themselves looking at their watches halfway through and lamenting the lack of big laughs.